Photoville, produced by United Photo Industries, is a free pop-up photo festival under the Brooklyn Bridge set in a modular exhibition venue built from re-purposed shipping containers and each year attended by over 90,000 people. 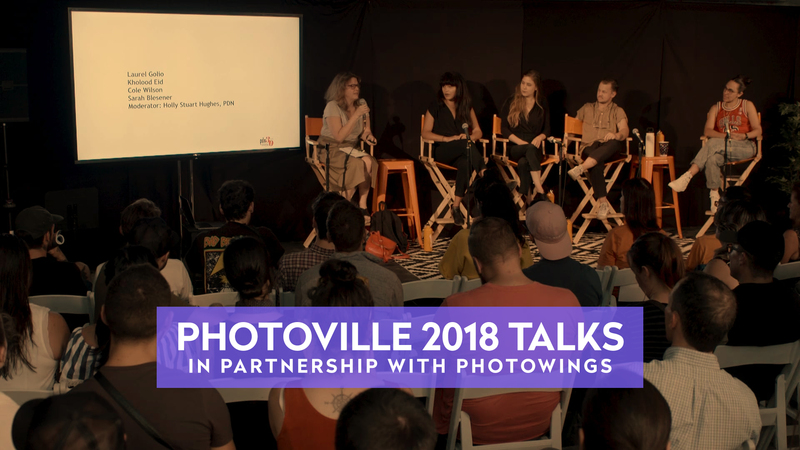 By creating a physical platform for a veritable cross-section of the world’s photographic community and the public to come together and interact, Photoville provides a unique opportunity to engage a diverse audience. In 2018, we expanded our partnership with UPI to include a variety of year-round educational professional development days and community building events including family photography evenings, student foto-field trips and Education Day events at Photoville. In 2017, we documented the Photoville Talks and which are available to the public on our website. We will also document the talks this year. For its seventh edition, Photoville will present work by more than 600 artists in 90 photography exhibitions & outdoor installations, providing an accessible venue for the public to experience both challenging and entertaining visual stories from a diverse group of artists, curators and organizations.In addition to exhibitions in and around the freight containers, Photoville offers panel discussions, artist lectures, professional development seminars, hands-on workshops, extraordinary nighttime programming, and our Education Day that brings together hundreds of public school students for a unique photo-based field trip. Photoville remains open to the public— dogs included—free of charge, making it unlike any other photo festival in the world. Click here to visit Photoville and learn more about them and our collaboration, and here to learn more about our Photoville Talks.